The chairman of Korean Air, one of Asia's biggest airlines, has passed away in the US, the company said. His leadership was overshadowed by several family scandals, including the infamous 'nut rage' incident. 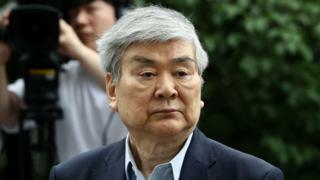 His son Cho Won-tae, Korean Air's president, is expected to succeed him as chairman, the Financial Times said. The Cho family made international headlines after a "nut rage" incident in 2014 involving Cho Hyun-ah, the eldest daughter of Cho Yang-ho - who is also known as Heather. Mr Cho's other daughter, Cho Hyun-min, left her position in the company after she allegedly splashed water in a colleague's face during a meeting. The scandals reopened a national debate about Korea's business landscape, which is dominated by family firms known as chaebols.